In 1993 I was an amazed, excited and overwhelmed 8 year old girl who had just seen Jurassic Park. I couldn't get enough! Fast forward 22 years and I am now an amazed, excited and overwhelmed 30 year old mum who has recently seen Jurassic World. I have always loved dinosaurs, and the Jurassic Park franchise since that first encounter in 1993. I met hubby, Luke, in 2001 - and guess what? He loves the franchise too. Naturally, it was a complete no-brainer that when we heard Jurassic World was coming to cinemas -and after we saw the trailers and advertorials - we could not wait to see it. It was definitely worth the wait. Jurassic World is an action-packed ride of emotional and explosive scenes that manage to capture the magic from the original and first instalment. It turned back to the unique selling point that dinosaurs could be attractions, in a theme park, with a merchandisable nature to boot. If you package this up you're left with the desirable feeling that leaves audiences to imagine (and inevitably wanting to) go there and see these creatures ourselves, up close. Children especially can be swept up in the imagination and possibility of it all; this was something the original film had in spades. Consequently, this is exactly why Jurassic World works. 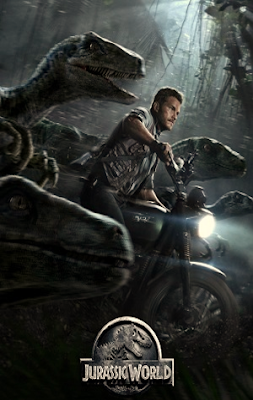 It draws us in as an audience, creates empathy for our hero, Owen Grady (Chris Pratt) and the flawed park manager, Claire Dearing (Bryce Dalllas Howard) and her nephews to enable us to want them to survive. But the real stars of the show are the dinosaurs themselves. 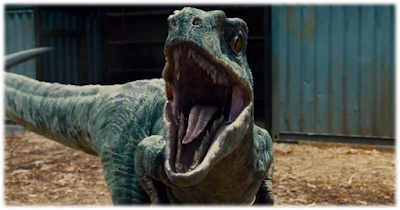 The Velociraptor pack, the new Indominus Rex and of course the nostalgic reprisal of the Tyranosaurs Rex herself, still showing her scars which she earned at the end of the first movie. These creatures breathe life into the screen and thrill us at each turn. As a huge JP fan - I was blown away by the initial scene of the Jurassic World Park - as the camera flew over the complex and passed through the gates a tear pricked my eye as those feelings of 'wanting to be there' rose to the surface. My overall rating: 5 out of 5. Oh I really want to see it now., I loved the first film like you when it came out. My son is going through a massive dino phase but I think think this is probably too scary for him at the moment, but roll on the dvd release. I never make it to the cinema at the moment. Guest Post: New job - New Breakfasts!